Getting a few orders out the door per day isn’t difficult, but when your order quantity begins to increase, it’s time to create an efficient workflow that will ship orders faster and with perfect accuracy. SKULabs offers an easy 3-step workflow built on cutting edge technology and systems pioneered by e-commerce industry leaders. This leads to a more simplified, accurate and efficient fulfillment process. Improving your order fulfillment will not only reduce your costs and improve your bottom line, but also ensures that your customers always get what they ordered the first time. In the following tutorial, we’ll go over how our 3-step fulfillment solution works, and how it can benefit your growing business. Setup begins on the SKULabs dashboard using any desktop or notebook. This allows you to add your sales channels, shipping carriers, printers, and users to one account. We also have a helpful setup wizard to guide you through the entire setup process. Once this step is completed, it’s time to add barcodes to each of your items. 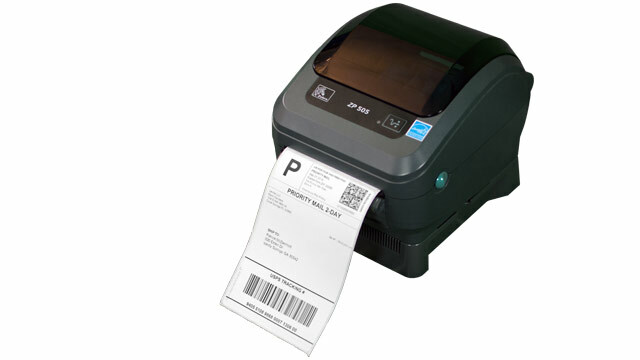 Barcodes allow the system to identify items scanned during fulfillment to ensure those items are picked correctly. This is accomplished by opening the Inventory panel and selecting the “Items” tab. Barcodes may be configured into kits or by individual items. For larger catalogs, we have a simple CSV import tool, which allows you to import all of your barcodes at once. For more information on how to set up your barcodes, please click here. While adding barcodes, it’s also a good time to assign locations for each product. By providing locations, the system can guide you through the picking process using the most efficient route. 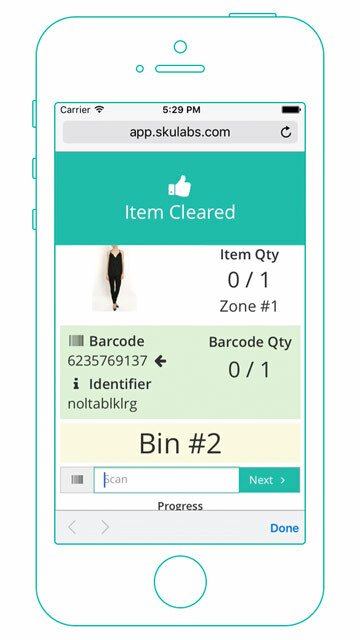 For example, if an item needed for an order is in close proximity to the last item scanned, it will be automatically placed next in the queue. This saves large amounts of time as routes are created automatically rather than depending on the picker to choose their own. To get the full benefit out of our software, there are a few inexpensive hardware items you will need. SKULabs works with most desktops, laptops, tablets, and mobile devices. For those who have FedEx or UPS Rewards, you can often get an iPod Touch for free using reward points. You will also need a Bluetooth scanner to verify item barcodes during picking. These scanners are available online through a number of manufacturers. Click here to see some of the scanner models that we recommend. The first step in our workflow is the picking process. The main goals here are to pick order items as quickly as possible and with 100% accuracy. This is achieved by using barcode-based item verification and by grouping orders into sorted batches to increase efficiency. Batch picking is a method of picking several orders at the same time. If you have several orders that contain similar items, you can eliminate redundant walking and picking time by picking those items all at once. For example, if you were picking a batch of five orders that each feature the same SKU, you would only need to retrieve that SKU once, rather than retrieving it separately for each order. Over the course of a day, a week or a month, the time savings can really add up. Even if you only pick a few orders a day, batch picking can get your orders out the door in half the time, providing more time to address other parts of your business. To start batch picking, open the Batches panel and configure your batch settings. These settings determine how the automatically generated batches will be configured. You can choose the number of orders in a batch, prioritize simple or more complex orders, or select the locations you want to work in. The system is fully flexible, allowing you to use any size bin, box or cart. Configurations are often based on the size of your products and the space between aisles available for you to travel in. After you’ve configured your batch settings, you can print out the labels for your bins in the Printing panel. Bin barcodes are used to ensure that the items scanned are placed in the correct bin. After you scan an item and place it in the bin, the system will ask you to scan the bin as well. Now that the batch settings are setup, it’s time to start our first batch. 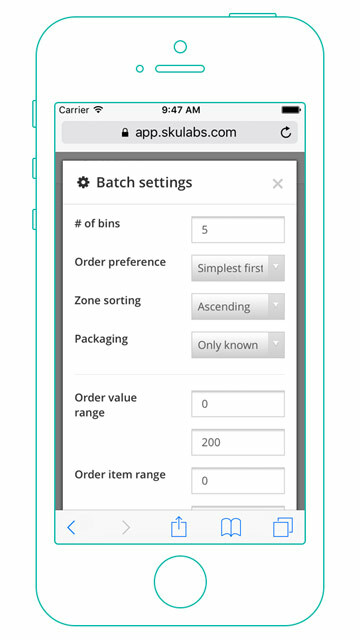 Simply click on the Batches tab on the left hand navigation bar, then select “Start New Batch.” This will automatically select the best order combination based on the batch settings you chose earlier. The system also allows you to sort your batches by items, zones, packaging and order value. In just seconds, SKULabs can sort what would have taken hours to do with paper invoices. Once you’ve opened a batch, the system will begin guiding your through your picking area. To reduce mental fatigue and room for error, the current step needed is highlighted on the screen. Simply follow the highlighted steps that change upon each scan to work through each batch. For example, the app will instruct you to go to the first zone. It will also tell you which item to pick first: “Scan 4 blue widgets and place them into bin 4.” Upon successfully scanning the 4 blue widgets and placing them into bin 4, the system will ask you to scan the barcode in front of the bin. This again is to ensure that items are placed in the correct bin. With each scan, the picker will receive audio and visual feedback indicating that the scan is correct or incorrect. If there are blue widgets for other orders in the batch, the app will instruct you to pull widgets for those orders as well. Once all of the required items in a zone have been picked, you will then be instructed to move to the closest zone with applicable items. Repeat these steps until all of the items in the batch have been picked, and you’ll be ready to move on to processing each shipment. SKULabs allows you to connect additional accounts for over 20 shipping services including UPS, Fedex and DHL. 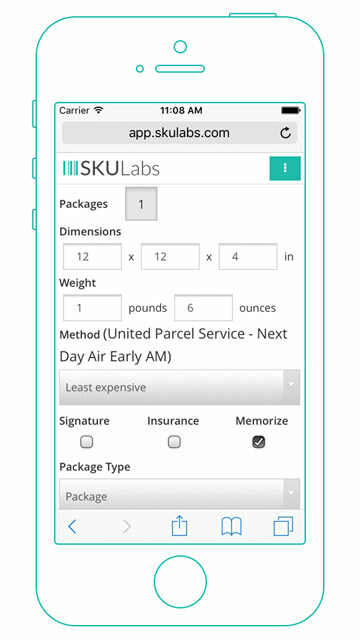 When processing shipments for your orders, you’ll be able to input the package dimensions and weight, and SKULabs will calculate postage rates for each of your connected carriers. This allows you to quickly compare all of the available rates at a glance and choose the best rate for each order. Shipments can be set to a default shipping method or changed based on the method chosen by your customers. In batch mode, you can quickly configure shipments for all of the orders in the batch at once. Once all of the shipments are configured, you can print out all of their labels and packing slips at the same time. If the batch contains orders from different sales channels, the branding and addresses will be changed accordingly. To customize your packing slips, go to the Settings panel and select the appropriate store. Best of all, SKULabs memorizes the shipping settings of orders, such as their package sizes and weights. When future orders have the same items, these package settings are automatically retrieved and inserted into the shipment settings. As you ship more orders, the software continues to memorize them and gets smarter as you go. 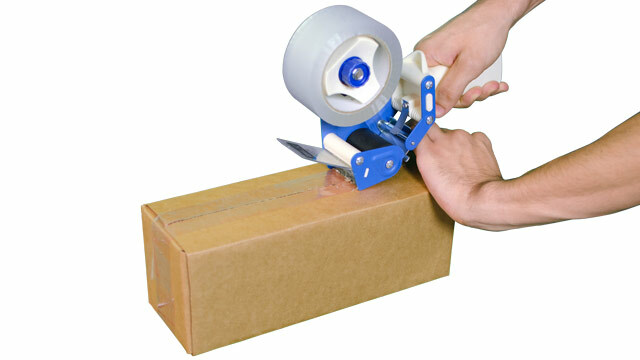 This saves considerable time as you won’t have to weigh and measure items on every order. While you're waiting for the labels and packing slips to print, SKULabs wastes no time. After clicking on the print button, you are immediately taken to the next screen where the user is told what size package they should use for each order. These package size recommendations are based on the memorized shipping settings. 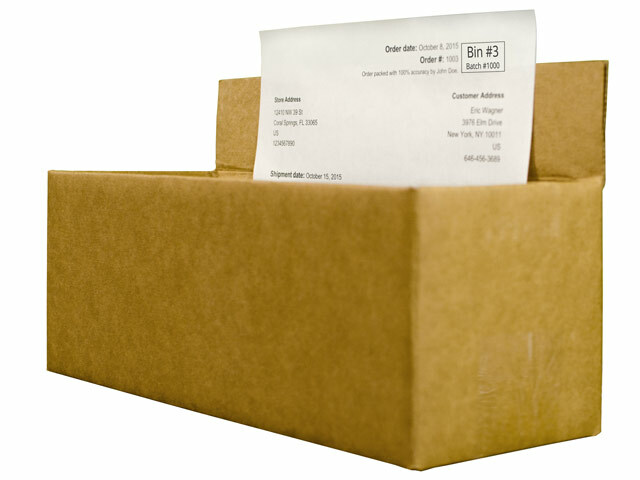 Once the packages are selected, the user simply places the items inside the packages and then gathers the printed packing slips and shipping labels. To ensure the correct packing slip and shipping label are applied to the correct package, the shipping labels and packing slips are numbered. For example, the shipping labels and packing slips would each be identified with a "Bin 1" marked somewhere on them. 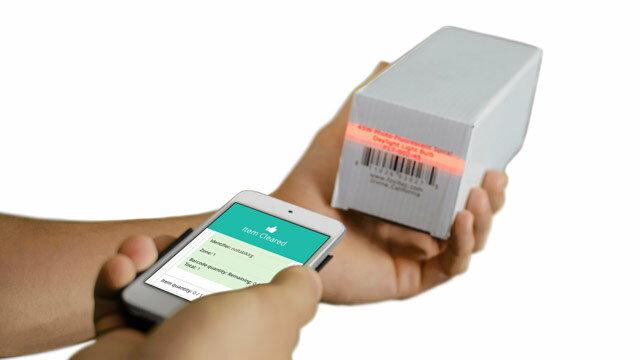 Once the order is packed and sealed with the shipping labels affixed to the outside of the package, SKULabs then automatically communicates with the sales channel, marking the order as shipped and providing a tracking number. Then all that’s left to do is to put the packages onto a cart and the batch is completed. Another powerful feature within the SKULabs software is our insights reporting. This allows you to review the performance of your pickers real time to see what areas they excel in and which areas need coaching. For example, performance metrics can be broken down by items per hour, orders per hour, batches per hour, scan accuracy, and more. Users can also be compared with each other, making insights a popular motivational tool for contests and employee reviews. Knowing how accurate and efficient your fulfillment staff are can help boost productivity and increase the bottom line. SKULabs is your all-in-one fulfillment software solution that will improve your order accuracy and dramatically reduce needed man hours. We specialized in the fulfillment process so you can spend more time running your business. Our support team is available seven days a week via phone, email, or live chat. Sign up today for a free demo and experience what hundreds of other businesses big and small use to get their orders out the door.